Leaky Shed Studio: A notepad to fit my purse--Celebrate Life! My purse is on the small size right now (okay, yes, I have a LOT of purses), AND it's an odd shape. So what do you do when you can't find what you want? Make it yourself, of course! The front and back covers are from one plate out of the 6x6 Bracket Album, sliced down the middle, and covered with map paper. A little ink, a little crayon, a rub-on . . .
And of course the Hot Air Balloon, also covered with ink and crayon. Simply cute some paper to fit the inside, hole punched, and added the ring with some tulle. This was so easy to make, I'm thinking it would be a good thing to make en masse and give as little gifties, along with a fun pen or two? And the album comes with SIX of the covers, plus a little one! 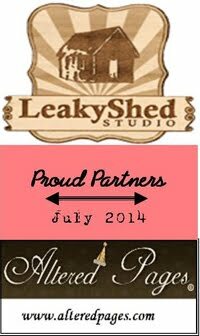 Thank you for stopping by my first every Leaky Shed Studio post, and have a wonderful Wednesday, everyone!